There is an expression in French to describe dusk: ‘entre chien et loup’. At the end of the day, in the dying of the light, it is hard to distinguish ‘between dog and wolf’ and objects take on an indeterminate menace in this state of perceptual ambiguity. This is the moment inhabited by the art of Marcus Rees Roberts. Working together with Pratt Contemporary, Studio 3 Gallery presents an exhibition of the darkly poetic work of Marcus Rees Roberts. The focus of the exhibition will be recent short films from The Winter Journey cycle, and related work in diverse media including By the Black Window (2013) – a work consisting of 24 drawings conceived for Studio 3 Gallery – and paintings from the Echo Song series (2012-13). Also exhibited are the book works Ash to Dark Water (2005), The Sad Sea (2009) and Night of Four Moons (2009), and the sets of prints Between Dog and Wolf (2008), Memory’s Wound (2010) and Echo Song (2012). In his current work Rees Roberts has taken inspiration from the poetry and writings of Miklós Radnóti, Federico Garciá Lorca, Paul Celan and Walter Benjamin: all of whom were victims of fascist persecution. Underlying his concern with modernist stylistic experimentation is the insistent political question of how the artist should bear witness to the atrocities of our times. Rich in poetic connotations and thematic leitmotifs, it is uncertain whether the Winter Journey envisaged by Rees Roberts is Radnóti’s forced march, Schubert’s Winterreise, or Odysseus’s voyage to Hades’ ‘dark shore’. Biography: Marcus Rees Roberts studied English at Cambridge, before moving to the Slade School of Art where he studied Film Theory and Printmaking, and was awarded the Slade Prize in 1977. 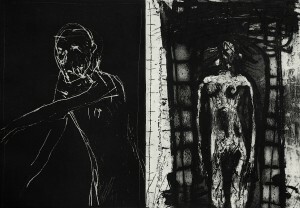 He lectured on printmaking at Edinburgh College of Art from 1980 until 1995 when he moved to London. 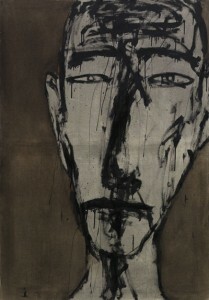 He is currently a Visiting Lecturer at West Dean College in Sussex. His work is represented in leading collections throughout the UK including the British Museum, the V&A, UCL Art Museum, the Ashmolean Museum, Scottish Arts Council and Pallant House Gallery.